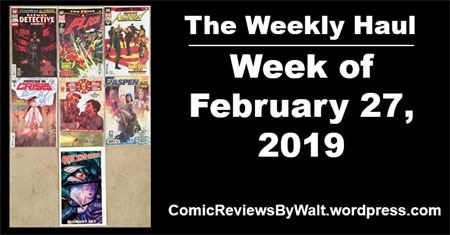 February ends with a rather small-ish comics week…but we have the ending of The Price, the newest Batman/Flash crossover (after 2017’s The Button) as well as the final triple-digit issue of Detective Comics! Detective Comics #999 is out…leaving us just a handful of weeks away from the second DC* title to hit the coveted #1000**. The Price wraps up, and I feel like the first three chapters of this–in under a month–have covered more ground than Heroes in Crisis itself! And I have got to get my Action Comics issues pulled together and catch up on my reading, with this Leviathan Rising story that apparently spills into a huge special issue and a couple of spin-off titles later this year. It’s the completist in me that keeps me getting Heroes in Crisis. Plus, wanting to be able to speak of it from experience and not just take issues with it because of clickbait-articles and such at Bleeding Cool. I’m grudgingly interested in where it winds up, and the true fate of Wally, and to see if there’s really anything to the story, as I do feel like so far it’s basically a ton of flashback, random talking, and hardly any PLOT. It’s also been relatively contained…I know several other comics have tied in but I don’t recall seeing any "logoed" issues with the Heroes in Crisis "branding" or ones that take their identity FROM being a tie-in. The Flash/Batman crossover this month seems to be the largest "tie-in" so far, and a Green Arrow issue last year dealing with Roy’s memorial. I may have missed something earlier in The Flash as I opted out on the post-Flash War stuff with the various Forces. 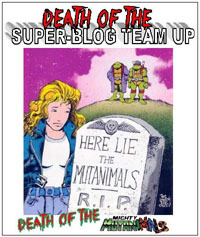 Like Action Comics, I need to get my issues of Die!Die!Die! pulled together and read. Yet another month where I thought I would have gotten to it, and so I get another issue rather than fall behind if a binge-catchup really does it for me. That said…I’m much more willing to buy like this for something from Image than I would be from say, Marvel, on principle. Finally, I won’t pass up a 25-cent Aspen sampler. Or most any brand-new 25-cent comic, for that matter. I posted this photo to Twitter the other day, but with so few new comics, how about an extra photo for this post? 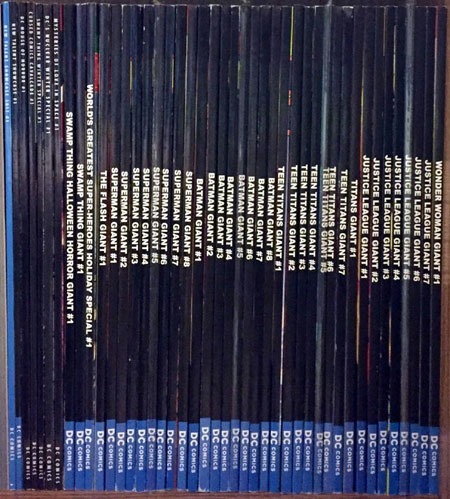 Here’s what all the Walmart DC 100-Page Giant*** issues look like, brought together! There are also some of the double-the-price-of-100-pagers 80-page specials that I’ve gotten over the past couple years. 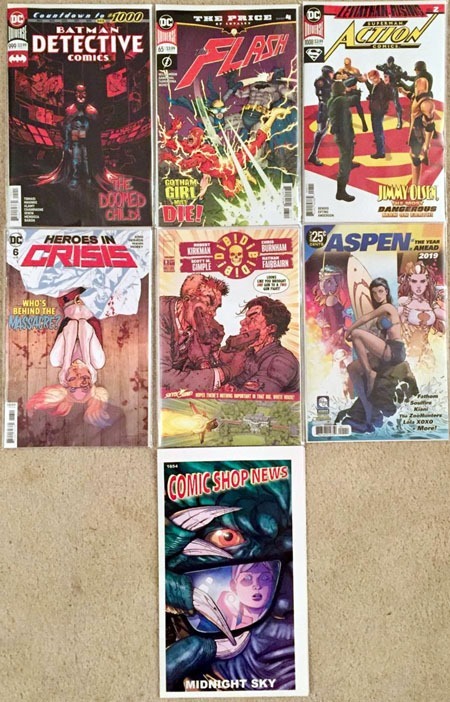 The Target-exclusive DC Primal Age and more recent Man and Superman issues are not here, though.